The position of the spleen amog the other organs of the body, seen in back and front view. 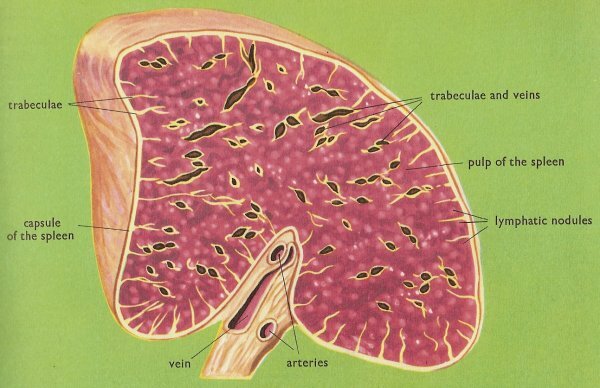 The structure of the spleen is rather complex. It is enclosed i an elastic capsule formed of fibrous tissue, in which unstriped muscle is incorporated. Internally it is divided into lobes that contain pulp of two kinds called, according to the color, the red pulp and the white pulp. The spleen is a lymphatic organ that lies behind the stomach, high up on the left side of the abdomen, on a level with the ninth to eleventh ribs. The spleen of an adult human weighs about 170 grams (6 ounces), and is 13–15 centimeters (5–6 inches) long, 7.5 centimeters (3 inches) wide, and 4 centimeters (1.5 inches) thick. It is elongate-oval in shape and of a dull purplish color. Although the spleen is located near the stomach it plays no part in digestion but is concerned only with the blood and the lymph and their circulations. All vertebrates have a spleen. 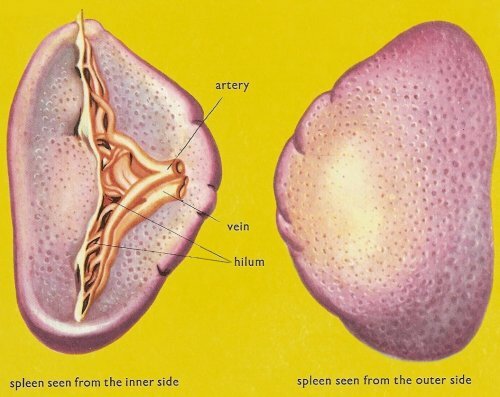 The spleen is similar to a lymph node in shape and structure but is much larger. In fact, it is the largest lymphatic organ in the body. It is enclosed in an elastic capsule of connective tissue, which extends inward to divide the organ into lobules. 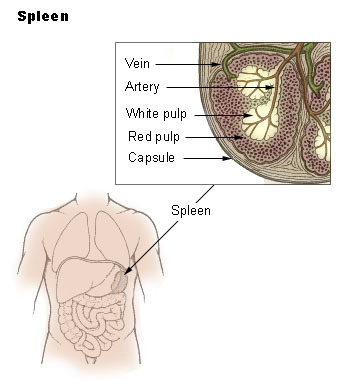 The spleen consists of two types of tissue called white pulp and red pulp. The white pulp is lymphatic tissue consisting mainly of lymphocytes around arteries. The red pulp consists of venous sinuses (cavities) filled with blood and cords of lymphatic cells, such as lymphocytes and macrophages. Blood enters the spleen through the splenic artery, moves through the sinuses where it is filtered, then leaves through the splenic vein. The splenic artery enters the spleen through a fissure called the hilum and divides into numerous branches, assuming an appearance rather like a brush; they are sometimes called the brush arteries. Each one of these arteries leads to a sinus whose function is to store the blood; when they are full the sinuses swell up and treble their volume. The spleen increases in volume while digestion is in progress and returns to its normal size when it is finished. In emergencies such as hemorrhage, smooth muscle in the vessel walls and in the capsule of the spleen contracts. This squeezes the blood out of the spleen into the general circulation. 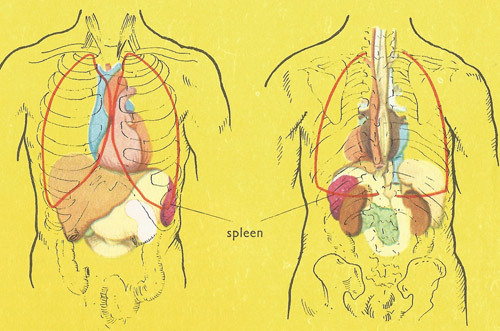 The spleen filters blood in much the way that the lymph nodes filter lymph. Lymphocytes in the spleen react to pathogens in the blood and attempt to destroy them. Macrophages then engulf the resulting debris, the damaged cells, and the other large particles. The spleen, along with the liver, removes old and damaged erythrocytes (red blood cells) from the circulating blood. An erythrocyte ceases to work effectively as an oxygen-carrier after about 15–16 weeks. Such aging cells are collected by the spleen and destroyed. The hemoglobin contained in them is broken down and used by the liver to make bile, and the iron in the recycled to make fresh hemoglobin. Like other lymphatic tissue, the spleen produces lymphocytes, especially in response to invading pathogens.